The current US government appears to be in a state of chaos, suffering from both internal issues and failures in diplomacy. Donald Trump's inexperience in Washington and politics has made him unprecedented in American history. Besides lacking in political experience, Trump has yet to form a cohesive team behind him. Nor does he have a clear policy framework either. Without a team, Trump cannot turn his ideas into concrete and implementable policies through his Twitter account and he is unable to effectively consult with relevant departments and Congress. Meanwhile, as the world's superpower, the US must reach internal strategic consensus on major domestic and foreign policies. But currently, the US is split from within - the Democratic Party and the Republican Party have become viciously polarized; Trump is now at odds with his own party as deep divergences appear between him and the established faction of the Republican Party; and even the West Wing of the White House and the Cabinet are entangled in a series of squabbles and petty bickering. Despite these numerous difficulties, it is too early to predict a premature end to the Trump presidency. In fact, Trump has made some precise judgments on many important issues and has been able to show some flexibility in making compromises. History shows that a Republican president must keep close ties with three key interest groups - the Wall Street-centered capital group, the energy sector (notable the oil industry), and the military-industrial complex. Notably, upon taking office, Trump quickly took measures to comfort the three interest groups and establish close ties with them. Trump has nominated three former Goldman Sachs executives to help him cope with economic and trade affairs. They have played a key role in preventing a trade war between China and the US. He has also used his presidential power to roll back his predecessor Barack Obama's tight control over Wall Street and made decisions favorable to Wall Street regarding currency and interest rates. Trump also reversed his campaign rhetoric and announced that the Chinese yuan is not being manipulated, in large part to deliver an olive branch to Wall Street. Since taking office, Trump has said the US would quit the Paris climate accord, and the country's official withdrawal from the pact on June 1 can be seen as a great boon for the domestic energy sector, reversing oppositional attitudes against Trump from energy groups. Despite promising to cut spending and having already made substantial cuts in several sectors, Trump has increased military spending and struck more arms deals to the delight of the military-industrial complex. These shifts in attitude of the three core interest groups toward Trump are the main reason why Trump's presidency could survive. The right-wing government of George W. Bush and the left-wing government of Obama have split American society and exposed deep divergences within it. Proof of this is easily seen in the ongoing conflicts between middle- and lower-class whites and the liberals represented by immigrants and the elite. If the establishment forces impeach Trump now, it will ignite these internal conflicts and is likely to create chaos. The new US administration has greatly eroded the country's international soft power, and the unilateralism it advocates has also sown seeds of discord within relations between the US and its allies. At the recent G7 summit, German Chancellor Angela Merkel suggested that Germany and Europe could no longer rely on the US under Trump. Unless common ground is reached soon, the enmity between them will become deeper. 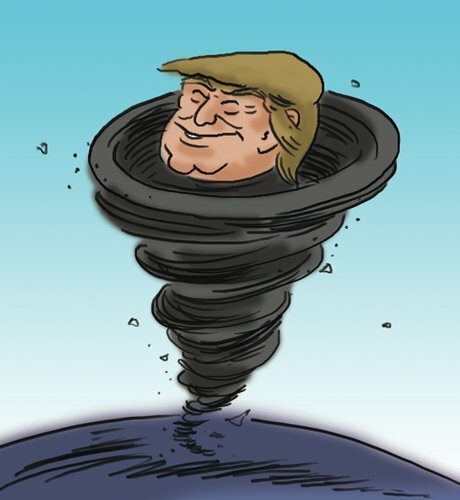 If the current "chaos" in both US' internal and external issues is not effectively managed, it will bring about a negative impact on the entire globe. This is true not only because the US is the main constructor and leader in the global order, but also because the ruling bureaucrats will likely wage an external war to shift attention elsewhere. This will be disastrous for China and the rest of the world, which need a peaceful and secure environment to pursue their development. During the Davos forum and the Belt and Road Forum for International Cooperation last month, Chinese President Xi Jinping stressed economic globalization driven by market economy and free trade and global governance based on multilateralism, which not only fits the times but also shows China's sense of reasonability as an emerging major power.